[#09] Genesis 1:11-12 – Was there Death before the Fall? A scientific reading of Genesis 1:11-12 leads to some very strange conclusions about the world God made. If there was no death of any kind before the fall of Adam and Eve into sin, then we cannot say that God’s creation was good, for it had a big flaw which would lead to oceans of bunnies and mountains of spiders. What? 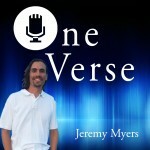 Yes, listen to this episode of the One Verse Podcast on Genesis 1:11-12 to learn more.